"My 4-year-old loves these quick and easy cheese snacks. Just 2 ingredients and a microwave are needed! Cut crosswise into pizza shape slices. 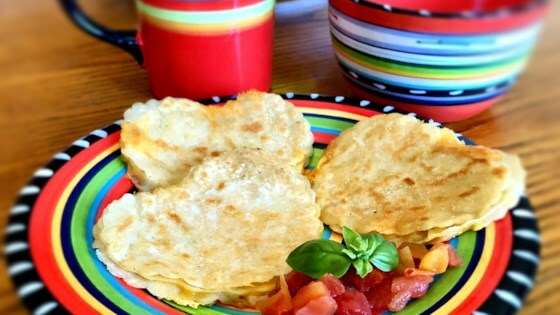 You can use any kind of cheese you want to and even any size flour tortilla. Serve with a little dish of ketchup to dip pieces into." Place 1 flour tortilla on a large microwave-safe plate; sprinkle with Cheddar cheese. Place the second flour tortilla atop the Cheddar layer. Cook on high in the microwave until cheese is melted, about 1 minute. As always, simple. Cheesy. With a touch of picante sauce. This works just as well with a stovetop griddle or a frying pan. I like using pepper jack cheese. Love it with a side of salsa and sour cream. I love this because you don't dirty up a pan making the kids a snack, just the plate they are eating from! I have taught my 7 year old how to make these for herself and little sister. My kids (2 and 4 yrs) made this themselves. It is SO simple to make. They ate it all and I can't wait to try it with some added ingredients. Perfect meal for a quick dinner. This is my daughter's favorite lunch. The tortilla is soft and the cheese is gooey.